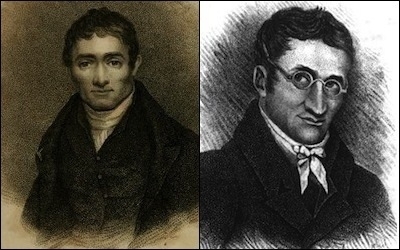 American preachers Pliny Fisk (left) and Levi Parsons embarked for the Holy Land in 1819. The author of this book, a professor of history at the University of Delaware, is an academic of diverse interests, having published volumes on the maritime communities of colonial Massachusetts and the origins of fervent Protestantism in the American South. She is also married to a retired Pentagon official who survived the terrorist atrocities of September 11, 2001. These varied concerns are brought together in the present account of Evangelical Protestant missionary activity in the Middle East during the 1820s. The institution she treats was the Boston-based American Board of Commissioners for Foreign Missions. The efforts it made among Muslims, after an early feint toward the Hindus of India, came under the rubric of a "Palestine mission." Heyrman has chosen to concentrate on two American preachers of the Evangelical word, Pliny Fisk and Levi Parsons, who made for the Holy Land via Christian Malta in 1819. They were graduates of Andover Theological Seminary, as it is known today, founded as a redoubt of strict Calvinism. The center of Evangelical zeal in post-Revolutionary America was in New England. Fascinating contradictions emerge from the tale. First, the United States in the aftermath of the Revolution appears almost agnostic in religion, with the promise of complete liberty of belief taken with great seriousness. The center of Evangelical zeal was to be found in New England, where a phenomenon known as the New Divinity flourished. Notwithstanding the early Republic's commitment to religious pluralism, Evangelicals at the time were haunted by what they perceived as the moral and theological dangers of their competitors. Hinduism and Islam were too remote to pose a threat, and Jews they simply disregarded, but Roman Catholicism (disparaged as the "Mystery Babylon"), as well as Unitarianism (which denied the divinity of Jesus), deism (which rejected Scripture), and other divergent interpretations of Protestant faith seemed to Evangelicals a perpetual challenge. Beginning almost two hundred years ago, Heyrman's chronicle is dense and includes considerable explanation before it reaches its core, which consists of the travels and observations of Fisk and Parsons in the Muslim East. This extensive scene-setting is probably necessary, in that much about our country in the post-Revolutionary period is unknown to Americans today. The American past is now as unfamiliar as the Muslim world was to Americans then. The extent of anti-Catholic animosity at that time is a shocking to recall. But it is equally amazing to find in these pages that some Protestants considered the rise of Wahhabi violence in Arabia—with its sacking of shrines at Mecca and Medina at the beginning of the 18th century, reported in the West—to be comparable to Protestantism in its hostility to alleged idolatry. 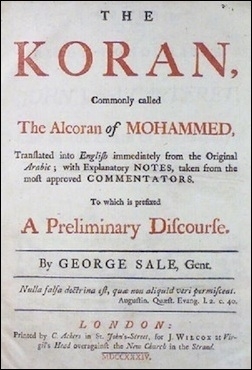 George Sale translated and published the Qur'an in English in 1734. Other voices on Islam competed with familiar stereotypes that Islam was everywhere introduced by force, and was based on unquestioning obedience to clerics. The scholar George Sale (1697-1736), who translated and published Qur'an in English in 1734, argued that Islam was not exclusively imposed on its adherents, but was appealing because of its strict monotheism and the identity of the God worshiped alike by Christians and Muslims. Sale's contemporary, the better-known Edward Gibbon, had praised Muhammad at length. They were not alone. Sale's book was intended to facilitate the conversion of Muslims. But reading Sale, whose volume was available in the Andover library, seems to have been the first of many openings in the mind of Fisk, in particular. The missionary pair landed at Malta, then proceeded to Smyrna (now called Izmir), which was their center of operations as they journeyed around the Holy Land. It is an irony of their biographies that they were capable of teaching Westerners more about Islam than they imparted Christianity to Muslims. They discovered that Muslim scholars were lucid and even curious about how Christians viewed both religions. Indeed, these early "Orientalists" merit defense if only for their adoption of a rational, rather than a prejudiced, view of Islam. In addition, they introduced printing to the region. The missionary campaign failed to win a single Muslim convert to Christianity. In 1822, Parsons, whose health was always weak, died in Egypt. Before his passing, he had acquired a tolerant attitude toward Roman Catholics and Muslims alike. In 1827, Pliny Fisk succumbed to a fever in Beirut. Most of their time had been spent in studying Arabic and interrogating Western converts to Islam. For example, Fisk cultivated the attentions of George Bethune English, a former divinity student from New England who had gone to the Middle East in 1818 as an agent of John Quincy Adams, then-secretary of state. English became Muslim, adopted the name Mohammed Vehbi Effendi, and rose to the rank of general in the army of a reforming Egyptian ruler, Mehmet Ali Pasha. Fisk accompanied English in his Egyptian duties and attempted to determine how sincere his acceptance of Islam had been. Heyrman's narrative includes many more curious biographies, including those of other Christians who claimed conversion to Islam, a few who alleged to have adopted an opposite view but then returned to Islam, and even a Jew, Joseph Wolff, who became Christian and then preached to Muslims. But a bloody turning point came in 1821 when the Greek uprising against the Ottomans brought about a rampage between Eastern Orthodox Christians (whom the Protestant missionaries disliked as much they did Roman Catholics) and the Turkish authorities. After that, the possibilities for mutual understanding created unintentionally by American Evangelical missionaries disappeared, and hostility between the Islamic world and the rest of the globe returned, continuing to the present. The missionary campaign had failed to win a single Muslim to Christianity, although, as Heyrman points out, it provided many opportunities for agitation against other Christians. In her view, the lesson of the experience is that Evangelical missionaries, more importantly, had—and lost—opportunities for a better understanding of Islam by Christians. Such awareness would obviously be most valuable today. Stephen Schwartz is executive director of the Center for Islamic Pluralism in Washington, DC, and a fellow at the Middle East Forum.